Secondary Inscription: (Recto) in upper left, inscribed in brown ink, "36"; (recto of mount) in lower left, inscribed in brown ink, "15.2 1/2 /20"; (verso of mount) inscribed, "Vandick" and inscribed by another hand, in brown ink, "Zn 11403/PAS/184"
Jan Cossiers probably drew this portrait sketch of his son Cornelis from life. He quickly captured the tilt of his son's head as he stares fixedly over his right shoulder. 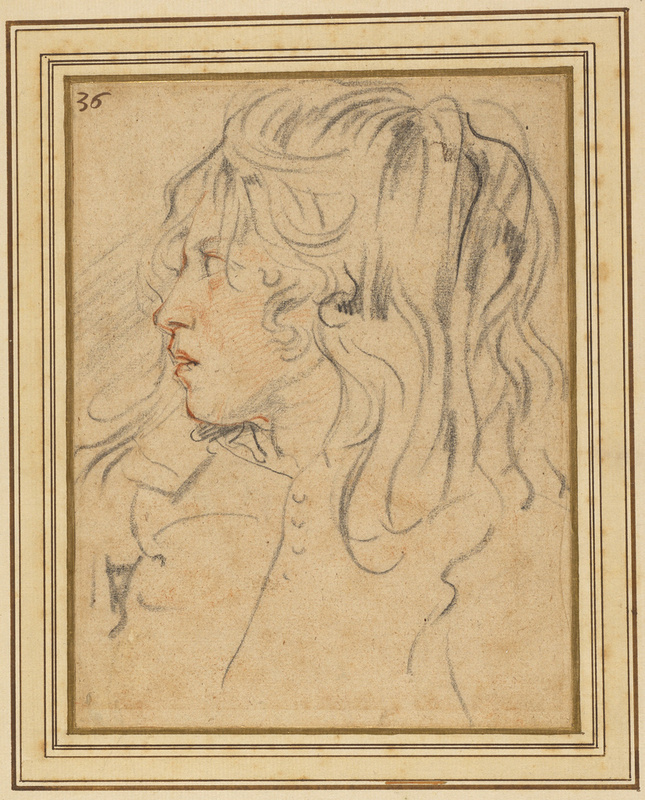 Loose, flowing strokes capture his strong profile, slightly open mouth, and tousled, shoulder-length hair. Black chalk delineates the boy's features, such as the hair, upturned nose and prominent upper lip, while subtle touches of red chalk describe the flesh tones. Cossiers made many sketches of his children, including the six sons from his second wife. He arranged the sketches, few of which survive, in accordance with the children's ages, beginning with the sheet representing the youngest boy. The number 36 in the upper left corner of the sheet indicates that there were once at least thirty-six numbered drawings grouped together.